No one is listening to Obama now. So the president’s State of the Union address is Tuesday night, and it’s always such a promising moment, a chance to wake everyone up and say “This I believe” and “Here we stand.” The networks are focused and alert, waiting to be filled with a president’s excellence and depth. It’s a chance for the American president to say whatever the storm, however high the seas, the union stands “rock-bottomed and copper-sheathed, one and indivisible.” That’s how Stephen Vincent Benet had Daniel Webster put it, in a play.In a State of the Union a president tries to put his stamp on things. Here we are, here’s where we’re going, all roads lead forward. We can face whatever test, meet whatever challenge, united in the desire that we be the greatest nation in the history of man . . .What great moments this tradition has given us. JFK’s father thought his son’s first State of the Union was better than his Inaugural Address. It had a warmth. “Mr. Speaker . . . it is a pleasure to return from whence I came. You are among my oldest friends in Washington—and this House is my oldest home.” Friends, home—another era. LBJ taking the reins in 1964: “Let this session of Congress be known as the session which did more for civil rights than the last hundred sessions combined.” And you know, that’s what it became. Nixon enjoyed dilating on history, and was interesting when he did.Reagan dazzled, though he told his diary he never got used to it: “I’ve made a mil. speeches in every kind of place to every kind of audience. Somehow there’s a thing about entering that chamber—goose bumps & a quiver.” There was his speech after he’d recovered from being shot—brio and gallantry. And of course Lenny Skutnik. Just before Reagan’s 1982 speech Mr. Skutnik, a government worker, saw Air Florida Flight 90 go into the Potomac. As others watched from the banks of the frozen river, Mr. Skutnik threw off his coat, dived in and swam like a golden retriever to save passengers. The night of the speech he was up there in the gallery next to the first lady, and when Reagan pointed him out the chamber exploded. This nice, quiet man who’d gone uncelebrated all his professional life, and then one day circumstances came together and he showed that beneath the bureaucrat’s clothing was the beating heart of a hero. Well. History still beckons, waiting to be made. The great unstated question of today: Can America come back, reclaim her old spirit, confidence and joy, can we make things again, build them, grow, create, push out into the new? And here I think: Oh dear. Because when I imagine Barack Obama’s State of the Union, I see a handsome, dignified man standing at the podium and behind him Joe Biden, sleeping. 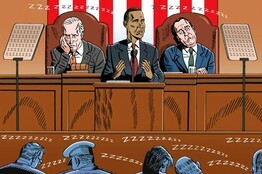 And next to him John Boehner, snoring. And arrayed before the president the members, napping. No one’s really listening to the president now. He has been for five years a nonstop wind-up talk machine. Most of it has been facile, bland, the same rounded words and rounded sentiments, the same soft accusations and excuses. I see him enjoying the sound of his voice as the network newsman leans forward eagerly, intently, nodding at the pearls, enacting interest, for this is the president and he is the anchorman and surely something important is being said with two such important men engaged. He gave a speech on the National Security Agency, that bitterly contested issue, the other day. Pew Research found half of those polled didn’t notice. National Journal’s Dustin Volz wrote that Americans greeted the speech with “collective indifference and broad skepticism.” Of the 1 in 10 who’d followed it, more than 70% doubted his proposals would help protect privacy. The bigger problem is that the president stands up there Tuesday night with ObamaCarenot a hazy promise but a fact. People now know it was badly thought, badly written and disastrously executed. It was supposed to make life better by expanding coverage. It has made it worse, by throwing people off coverage. And—as we all know now but did not last year—the program was passed only with the aid of a giant lie. Now everyone knows if you liked your plan, your doctor, your deductible, you can’t keep them. When the central domestic fact of your presidency was a fraud, people won’t listen to you anymore. The poor speechwriters. They are always just a little more in touch with public sentiment than a president can be—they get to move around in the world, they know what people are saying. They have to imitate the optimism of the speeches of yore, they have to rouse. They are the ones who know what a heavy freaking lift it is, what an impossible chore. And they have to do it with idiots in the staffing process scrawling on the margins of the draft: “More applause lines!” The speechwriters know the answer is fewer applause lines, more thought, more humility and candor. Americans aren’t impressed anymore by congressmen taking to their feet and cheering. They look as if they have electric buzzers on their butts that shoot them into the air when the applause line comes. “Now I have to get up and enact enthusiasm” is what they look like they’re thinking. While the other party thinks “Now we have to get up too, because what he said was anodyne and patriotic and we can’t not stand up for that.” And they applaud, diffidently, because they don’t want the folks back home—the few who are watching—to say they looked a little too enthusiastic about the guy who just cost them their insurance. They are all enacting. They are all replicating. They’re all imitating the past. You know when we will know America is starting to come back? When some day the sergeant at arms bellows: “Mr. Speaker, the president of the United States” and the camera shows a bubble of suits and one person emerges from the pack and walks into the chamber and you’re watching at home and you find yourself—against everything you know, against all the accumulated knowledge of the past—interested. It’ll take you aback when you realize you’re interested in what he’ll say! And the members won’t just be enacting, they’ll be leaning forward to hear. That is when you’ll know America just might come back.